A replica of the 1970s Mothership will be displayed at the Smithsonian's National Museum of African American History and Culture. It'll be located at museum's Musical Crossroads gallery and displayed with music and concert footage of the Mothership on stage. As if we needed more of a reason to go to D.C.'s museums. 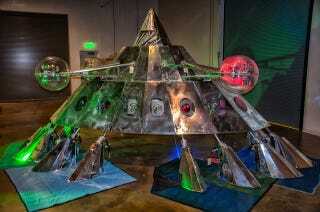 The replica that'll be on display was made in the 1990s and was located in George Clinton's Tallahasee, FL home. The original was sadly destroyed after the band went into debt in the 1980s. The man who worked on both the original and the replica, roadie Bernie Walden, helped assemble the Mothership in its new home. That assembly went much smoother than the original's first deployment, which Walden says had so much carbon dioxide spilling from it that "people in the front row were passing out." He really developed this grand idea of envisioning African-Americans in space as a way to liberate one's mind from the shackles of racism and poverty or any other societal constraints. The Mothership was this symbolic mode of transporting the conscious self into this ethereal place, which was pretty funky and pretty far out, but represents the grander scope of his thinking.